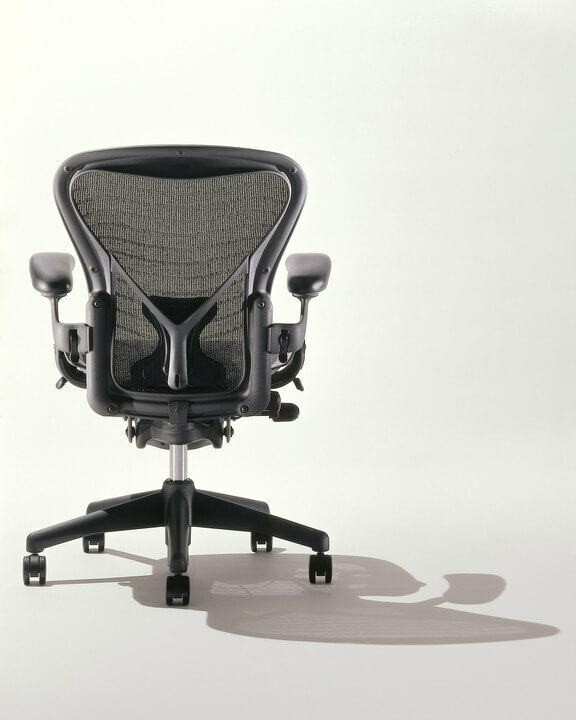 Are you interested in the Aeron chair? This ergonomic chair has a lot of benefits and features that make it an outstanding buy when it comes to a comfortable chair for work or school. This is a very popular chair that was first released back in 1994. The chair is as cutting edge today as it was back then and it’s a very iconic looking chair. The chair can even be found in the Museum of Modern Arts. It was the first to have tilt tension which you access on the right side of the chair. Most chairs have this on the pedestal so you’re bending forward to reach it. This requires you to contort a bit to make the adjustment. The Aeron makes this adjustment easy. This is our favorite chair for a number of reasons. Here’s why we love this chair any why you will enjoy your Aeron chair as much as we do. 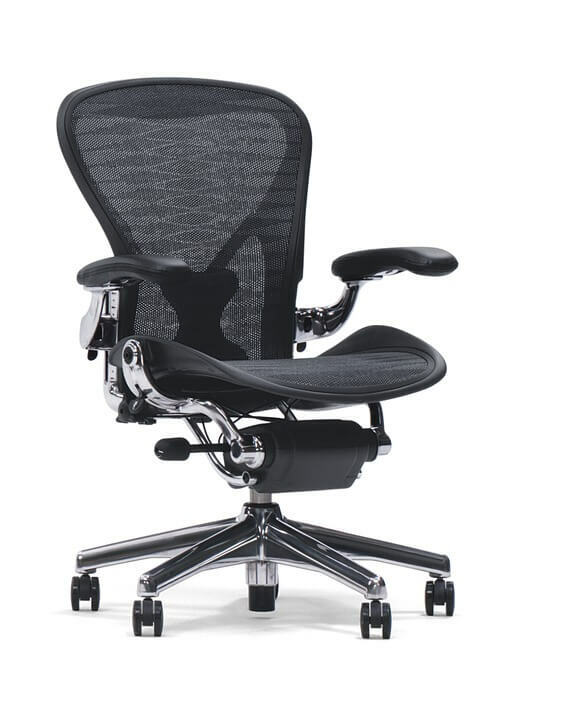 The Aeron chair has a good price for a high-end chair. You can find it through many vendors for $850 dollars or so. This price is for a chair with all the features such as a Posture Fit back support and other options. You’ll spend just over $800 for the chair that has reversible lumbar support runs. The basic model without forward tilt or armrests is just over $600 dollars so you still get great value in the lower range chairs. The chair is priced very competitively with other chairs in this type of range and you also get and excellent warranty with your chair. It’s perfect for the officer where the chair is going to be used all the time or for your computer workspace at home. You can use this to determine which size chair is going to be best for you. Sit in all sizes of this chair and find one that is comfortable for you. The mesh on the chair reduces heat build-up so you’ll keep cool and not sweat as much when sitting in the chair. This can be beneficial when the weather gets warmer. The chair has various lumbar support options. The first support is like a cylinder that is flattened along the sides. On one half of the support it’s thicker that on the other side so you have options for the amount of pressure in the lumbar area that you get. 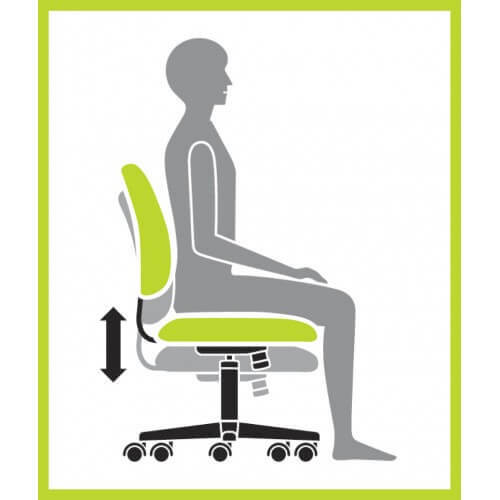 The support slides up and down the lower back of the chair so you can adjust it to the way you want it. 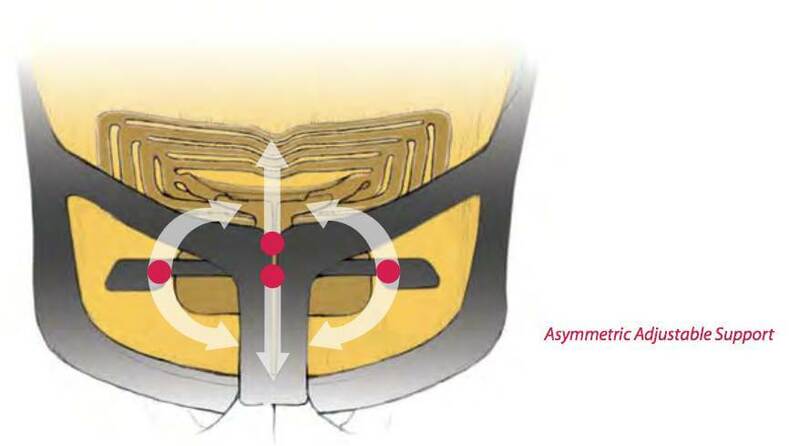 The second support is more for your pelvic area which is called the Posture Fit. This support tiles your hips forward and your lumbar area goes in to a relaxed position. 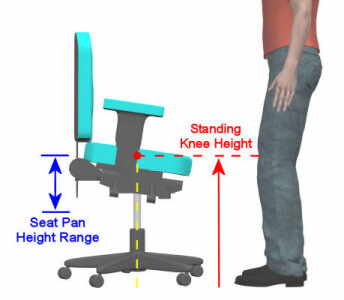 The Posture Fit works well when the chair is in a forward tilt position. There’s a dial for moving the armrests up and down on the chair. Some newer models feature a quick release latch which makes the adjustment easier on the arms. You can set each armrest to the same position so they are comfortable. 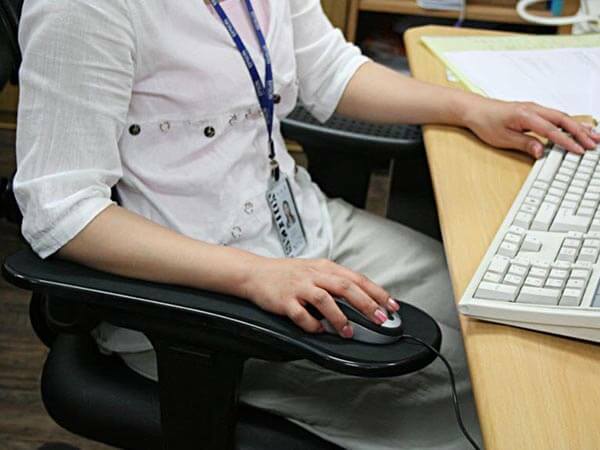 The armrests can be difficult for people with short arms or narrow shoulders as they only have a fixed length but for the most part they are quite comfortable on the Aeron chair. The chair has a forward tilt feature which women tend to like as it removes the room between their upper back and the back rest of this ergonomic chair. The control is a bit difficult to sue but with practice it’s not too much trouble. You’ll need to disengage this before you cаn use the forward tilt feature of the chair. Its right behind the forward tilt adjustment feature. The Aeron chair has good tilt tension and you’ll find this on the right side of your chair. Just turn the knob as the arrows indicate for more or less tension in your chair. This feature is easy to sue. The seat has an adjustment for the seat depth. Each chair size has its own seat depth for your comfort. You might not need the lumbar support feature of this chair. This all depends on how much you sit in the chair during the day. You should try the support but depending upon your needs you might not want it on your chair. It’s entirely a preference on your part and you might be fine by just using the back of the chair for your support and doing away with the lumbar support all together. You might find the Posture Fit to be a better choice but this all depends upon what you need. This feature seems to work for most people. Get several sizes in the chair if you’re buying them for your office. Don’t just get all B chairs because some people will have more comfort with the A and C sized chairs than just the regular B chairs. Get mostly B chairs but make sure you buy some of the other sizes as well. If you’re buying the chair for personal use then go to the store and try out all the sizes until you find one that works for you. For a conference room you might want to go with all base models as you really don’t need all the added features for this type of chair use. You won’t be sitting in thesе chairs all day long for the most part so the basic chairs should suit your needs. Size B should be fine for the conference room and should suit most people for short periods of time. If you’re female you will enjoy a fully loaded chair and get the Posture Fit for the pelvic support. 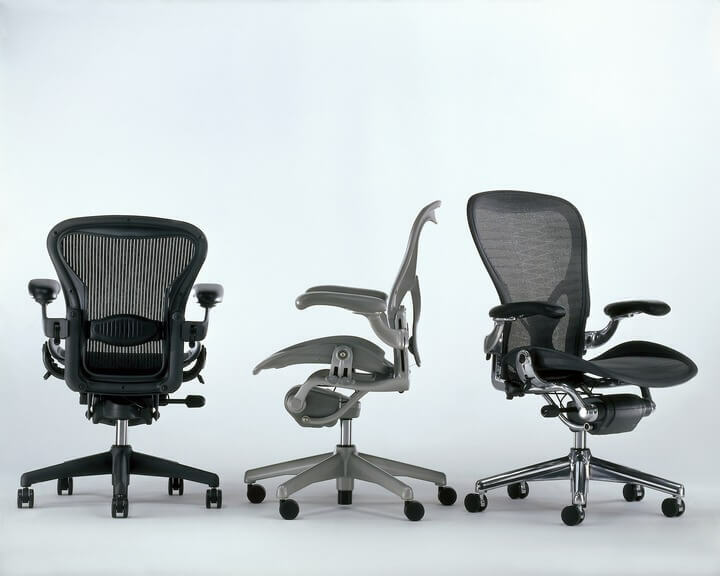 Make sure you get the right sized chair by either using the Herman Miller sizing chart or by trying out the chair at the store before you buy one. For a male you’ll be better off with the pelvic support option as it’s recommended over the lumbar pad feature. If you don’t need back support you cаn probably do without forward tilt as well. Tall men will want to get the extended range cylinder so the chair is comfortable for you. Executives can go for all the bells and whistles with the chair and be sure you get the leather armrests. Get an aluminum base for some added touches to your chair. You can use whatever supports that you feel comfortable with when it comes to back support. Make sure that you get a full 12 year warranty with your chair. Don’t take off the sticker underneath the chair as this contains your warranty number which you need. If you buy the used chair you can still have the remainder of the warranty transferred over to you as long as the chair is still under warranty. This warranty is a very good one as most products today only come with a one or two year warranty if you’re lucky or you have to pay extra for extended warranties. A 12 year warranty on a chair is an exceptional value in today’s marketplace. For places where the chair is used all the time this is the type of warranty that you want to have available to you. Green guard certified – This means that the chair is designed to improve human health, improve air quality, and reduce your exposure to pollutants. The chair is made from very low emitting materials so you’re getting a great chair that benefits the environment too. BIFMA level 2 – This is the Business and Institutional Furniture Makers Association which develops the standard for office furniture in North America. The standard it uses is called “level” hence the label given to this chair. Cradle to Cradle Silver Certified – this means that the chair has been assessed in 5 categories which are renewable energy use, material reutilization, material health, social responsibility, and water stewardship. 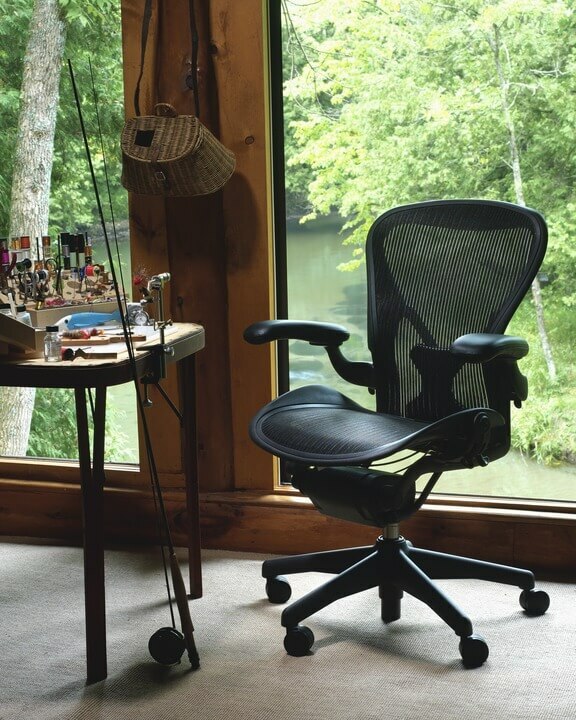 This Aeron chair is 94% recyclable and its manufactured form 53% recycled materials. The mesh on this chair can be a bit firm so you may find it takes time to get used to the chair. Your body will need a couple of weeks to get used to the firmness of the chair. Make sure you give the chair some time as your body will adapt to the chair over time and you’ll get more comfort out of the chair. There a ridged support piece under the front underside of the chair. You may feel some pressure in your legs due to this piece. Don’t lower the chair to avoid the pressure point but have your feet elevated. Using the chair in the forward tilt position can also reduce this problem some. The Aeon chair has a lot going for it and this piece of office furniture is well worth the investment. The various sizes of the chair make it ideal for all body types and there are tons of features on the chair that can provide comfort for you. You have enough options in the Aeon chair that you can pick something that will work for you. Be sure you try all the sizes and get one that feels comfortable for your body type. This chair has stood up to time and it’s one of the best chairs you can buy for any application. It makes the perfect solution for the home office or for the work environment. With over 12 years on the warranty side you can feel confident that you’ll be well looked after far into the future if you buy this chair. If you want a chair to meet all your needs then you should go with this ergonomic chair as you won’t be disappointed in the detail of the chair or the design. If you need a high-quality chair then the Aeon chair makes a wise investment as it will last you a long time and provide you with the comfort that you need. This chair has few drawbacks which make it a solid purchasing decision for home, office or other use. It is the best review on the Aeron chair. I am very happy using this seat for three years. No problem with this chair. I had one of these chairs without the tilt limiter. I killed my back, I was always fighting to try and find the correct tension. Got one now with a tilt limiter and all is good.